Plastic moulding shrinkage is the contraction of a plastic moulding as it cools after injection. Most shrinkage occurs in the mould during cooling, but some shrinkage occurs after ejection, as the part continues to cool. After that, the part may continue to shrink very slightly for several hours or even days until the temperature and moisture content stabilise. All polymers have different shrink rates depending on many factors. These include amorphous or crystalline materials, cycle times, temperatures, mould design, part shape and wall thickness. This information should be used as an 'on the spot' reference only. Users should always follow the material suppliers processing data sheets. The data is provided “as is” and without any representation or warranty of any kind, including that it is fit for any purpose or of merchantable quality, or functions as intended or at all. Your use of this data is entirely at your own risk and PlastikCity accepts no liability of any kind. 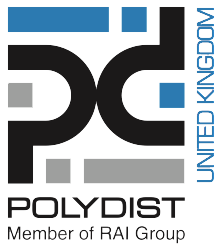 Polydist (UK) are part of 'the new Pan-European polymer distribution company', Polydist Europe. Our affiliate offices in Spain, Turkey, Benelux, Germany and France, our strong European network and our excellent relationships with some of the World's leading polymer producers enable us to act as your European polymer supermarket. Our product portfolio is exceptionally varied and vast.